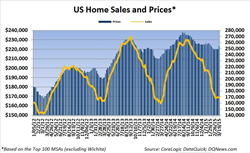 Peoples Home Equity comments on the latest "National Home Sales Snapshot" from DQnews.com. Lenders like Peoples Home Equity knows were neutral in their response to Thursday’s weekly home sales report. According to the latest March 26th “National Home Sales Snapshot” by DQnews.com, weekly home sales decreased -0.6% to 169,053 however median home sale prices increased 1.4% to $223,000. This is the first time sales have declined after two consecutive weeks of increasing; it’s also the first time sale prices have increased in the past 5 weeks. Peoples Home Equity thinks the winter seasonal slump has ended, but due to continued cold weather, sales have not followed through to the upside. As for median home sale prices, it’s obvious that listing prices are already higher in anticipation of higher home sales activity. Peoples Home Equity fully expects median home sale prices to increase just as high as last year during the late summer. Thus far, median home sale prices are already 5.2% higher than last year, which is the highest, reached all year, and 31.2% higher than 3 years ago. Also, while home sales decreased on a weekly basis they did rise slightly versus a year ago from 3.4% last week to 3.5% this week. Peoples Home Equity thinks market spectators will witness an increase in home sales the next two weeks thanks to the recent 9.5% surge in mortgage applications for the week ending on March 27th, as shown on TradingEconomics.com. This increase in mortgage applications, which should also continue to climb, will translate into higher home sales soon and demand driven higher listing/sales prices. If interested in purchasing a property and are in in need of a mortgage, consider speaking to a Peoples Home Equity loan officer today at: 262-563-4026.